Linen Christmas Stockings Embroidered on the Cuff. We have 3 designs - one for Cat, another for Dog and another for the Human members of the family. Measurements: The stocking is plenty big, about 20" diagonally and 8" wide. Materials: The stocking is made from linen and red cotton. 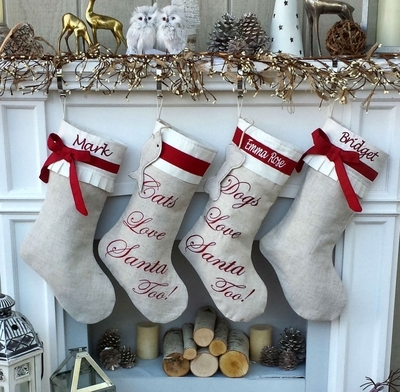 Lining: This stocking is lined inside with white linen.